Bosham FC are celebrating after almost doubling their record victory as our local football teams enjoy a goal-laden start to the new season. It was raining goals at Glebelands on Tuesday night as Bosham beat a hapless Ferring side 15-1. Jake Lafferty helped himself to five, with Marco Giambelardini hitting four. Assistant player-boss Neil Redman weighed in with two, including a rare header, while new signing Ollie Gilbert and Graeme Dowden also hit two each. It was 2-1 at one stage with Jack Nieve scoring for Ferring before the Reds raced into a 7-1 half-time advantage. The scoreline dwarfs Bosham’s previous best win, an 8-0 victory – ironically also at Ferring – on the opening day of the 2014-15 season. It is not quite the freak result it appears – Ferring went into the game on the back of an 18-0 demolition in their season opener at newly-promoted Jarvis Brook. Ferring have a new team and young manager who are clearly struggling to find their feet at this level. Bosham have had many tussles with Ferring over the years and say they hope their rivals can turn their fortunes around as the season progresses. The romp is the highlight of what has been a goal-feast of a start to the season for our local SCFL teams. Bosham, with 17 goals in two games, sit second in division two with six points from six, though they are still behind Jarvis Brook on goal difference. Sidlesham are also in division two this season and as Bosham were hitting 15 in midweek, they were suffering a relative goal drought at home to Clymping. They won by a mere 5-0 margin as new boss Daren Pearce got his first win under his belt and the Sids moved into the top six. Callum Dowdell (2), John Phillips, Tom Jefkins and Tom Bayley scored the goals. Roffey began with apprehension and Sidlesham took advantage whe a long ball forward and some mis-communication in the home defence saw Adam Wicking head into his own goal. Roffey began to grow into the game and snuff out any threat from Sids, much of which came from Tom Bayley. Ben Chowney was denied from inside the six-yard box by Connor Kelly in the Sidlesham goal and other home chances were spurned. Excellent last-ditch defending from Sidlesham’s Matt Roberts prevented an equaliser - but one did come in the 44th minute as a well-worked short corner was converted by Wicking. The second half began with further Roffey chances. Sidlesham looked to counter-attack and John Phillips looked to support Bayley, while Joe Jefkins and Callum Dowdell attacked well down the flanks. Roffey were looking to turn one point into three and managed it in the 88th minute when a delightful ball curled to the far post saw sub Harri Nourse power a header back across Kelly and into the far corner. Sidlesham looked a very good side and hope to be among the frontrunners for the league title. SIDLESHAM: Kelly, Williams, Sandalls, Robinson (c), Leggat, Roberts, Jefkins, Parsons, Bayley, Phillips, Dowdell. Subs: Jefkins, Williams, Watts, McCoy, Bassil. 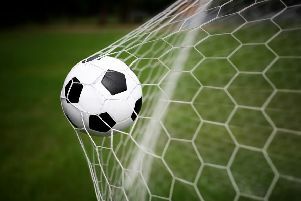 Bosham began their new SCFL season with a firm statement of intent in sealing a comfortable win at newly-promoted Lancing United. The Reds, division two cup champions were looking to start with a bang and send a message to the other teams and two second-half, goals saw them do just that. It was a very blustery afternoon at the Croshaw ground, with Bosham taking advantage of the wind in the first half. In their change blue strip they struggled to cope with conditions. Marco Giambelardini looked sharp and fellow strike partners Graeme Dowden and Alex Barnes ably supported him but chances were few. Close to the half-hour, Dowden unleashed a strong effort that smacked the crossbar with keeper Steve Allfrey rooted to the spot. Right on half-time Lancing had their best chance when Mark O’Regan got in on goal but he sent his effort wide. Bosham settled the better from the re-start and, though the harsh wind was against them, they used their quality well. Bradley Miles was creating, Barnes and Dowden finding gaps and the reward came when Barnes got free in the box and was found unmarked to fire a cross-shot under Allfrey and in. Late on, Giambelardini settled any Bosham nerves with a typically classy finish, curling an exquisite effort from the edge of the area into the bottom corner, past the outstretched hand of Allfrey. Bosham held firm and kept the Lancing dangermen quiet to the delight of the management team of Andy Probee and Neil Redman. Although fellow promoted side Jarvis Brook, won 18-0 (eighteen) against Ferring, Bosham can be pleased with the start to their campaign. They have a trip to Montpellier Villa on Saturday and a first home game of the season on bank holiday Monday against Clymping at Walton Lane. Bosham: Magee, Docherty, Bulbeck, Colinese, Bell, Barnes, Miles, Lafferty, Giambelardini, Dowden, Probee. Subs: Redman, Gilbert.